The Three Peaks Race tests more than just one sporting skill. The Hydro Tasmanian Three Peaks Race is definitely not for the faint hearted. In some ways I'm referring to what the spectators go through too, as they watch participants go through the required rounds. Scaling one peak is challenging enough - to me at least. Getting to the summit of three peaks, and also having to race by both land and sea - that's pretty grueling. The Easter long weekend is anything but a holiday for participants in this race. This non-stop race takes place over 4 days, beginning at Beauty Point (near Launceston) and ending at Hobart. It is made up of a series of legs, some over land, some over water. On land, competitors have to scale Mt Strzelecki, Mt Freycinet and Mt Wellington - hence the name of the race. 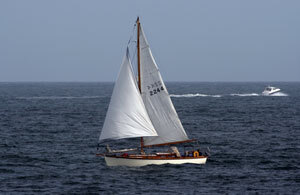 On water, competitors travel to Flinders Island, Coles Bay and Hobart. This major Tasmanian sporting event is recognised as a true test of endurance combining two sporting disciplines. It attracts competitors from other parts of Australia, and from other countries as well.